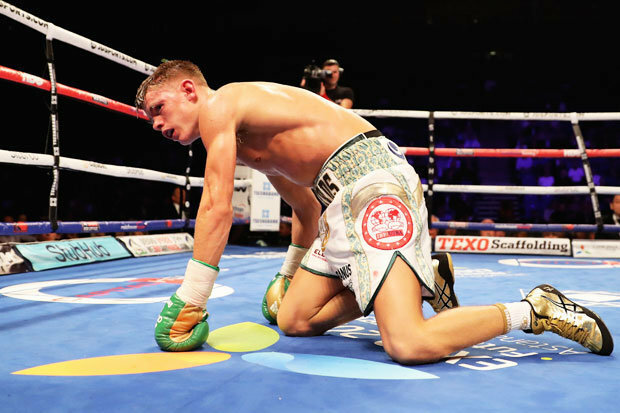 CHARLIE EDWARDS was stopped by John Riel Casimero as he came up short in his bid to become a world champion in just his ninth professional fight. The Croydon-born fighter made the brave move to face the IBF flyweight champion despite his inexperience in the paid ranks. But his dream turned into a nightmare when he was floored in the 10th round by a stunning left hook from the Filipino. Edwards beat the count but Casimero pounced to force referee Steve Gray to call it off. The former GB amateur star had struggled to deal with Casimero’s relentless pressure throughout the contest. The defending champion looked in control and was landing big right hands in every round. Edwards, in the biggest fight of his career, looked nervous in the early exchanges and seemed keen to stay on the outside. But Casimero was still landing enough to take the rounds as he totted up a healthy advantage on the scorecards. When Edwards started to stay in the centre of the ring he had some success but could not deter the champion from coming forward. A big right in fourth seemed to wobble the brave challenger but he recovered well and was given hope by a cut opening up on by Casimero’s eye. It was desperation time in the seventh though as a huge right uppercut shook Edwards. Despite his relative inexperience as a professional – he was an experienced amateur – he showed some nous to hold the champion as his head cleared. But there would be no chance to recover in the 10th when he hit the canvas hard when Casimero crunched in the left hook. The champion peppered Edwards on the ropes after he got to his feet and Gray did the right thing to bring the brave challenge to an end. Many will say too soon for Edwards but it was an opportunity he could not turn down. And at 23 the big nights will come again for the Croydon man. Photo: Lee Haskins, right, defeated Stuart Hall by unanimous decision to retain his bantamweight belt. LONDON -- Bantamweight titleholder Lee Haskins vowed to knock out his British countryman and former titlist Stuart Hall in the sixth round when they met on Saturday night on the Gennady Golovkin-Kell Brook undercard at the sold-out O2 Arena. But while Haskins whiffed on his prediction, he grinded out a unanimous decision, winning on scores of 117-111, 116-112 and 115-113 to retain his title for the second time. ESPN.com scored the fight 114-114. Haskins controlled most of the first half of the fight before Hall came on very strong in the final third, when Haskins appeared to be winded. "It's hard not to tire against someone like Stuart," Haskins said. "I feel like I was winning the fight clearly with my shots. I made him miss a lot and I think that is what won the fight for me. "You try boxing this guy. He just keeps coming forward, forward, forward. He's like a pit bull and take it from me -- he hits very hard. I am not stupid enough to stand here and get caught by big shots. I'm not here to show I'm the toughest man in Britain. I'm here to win fights and get paid." The 32-year-old Haskins (34-3, 14 KOs) and Hall, 36, were meeting in a rematch of Haskins' 2012 unanimous decision to win the vacant European title. Now Haskins is 2-0 against Hall (20-5-2, 7 KOs), whose four-fight winning streak came to an end. He was bidding to regain the 118-pound world title he held from December 2013 to June 2014. Haskins and Hall were chippy with each other during the buildup and the emotion spilled over at Wednesday's final news conference when Haskins slapped at Hall as they faced off for a photo, forcing them to be pulled apart as tempers flared. But early in the fight they showed a lot of respect for each other and meaningful punches were few and far between. Haskins appeared to win many close rounds in the first half of the bout on the strength of a decent jab that regularly caught a lunging Hall, who tackled Haskins to the mat in the fifth round. In the seventh round, Hall landed a good left hand to the head that got Haskins' attention. He was out of sorts for a few moments but then regained his balance and began to jab again. Hall's corner implored him to throw more punches and he tried, catching Haskins a few times in the eighth round that sent him on the run. Hall continued to press forward and forced Haskins into retreat during the ninth round as the momentum seemed to swing his way. And then he hurt Haskins with a left hand in the 11th round. Hall came out steaming toward Haskins to open the 12th round with the fight seemingly on the table. He was all over Haskins, who did his best to box and move away from the intense pressure. "I could have edged it but I think I started a bit late," Hall admitted. "I thought it was closer than the points but I started late. It was silly and it is a bad night. "I should have started a bit earlier. I gave him too much time in the first few rounds. I thought I did enough to maybe nick it at the end but in the first few rounds I didn't do enough." Gennady Golovkin: Kell Brook was easy, now time for Billy Joe Saunders! If Gennady Golovkin gets his way he will return to London one foggy night this winter to inflict the same eye-busting punishment on Billy Joe Saunders which put a savage, hospitalising end to five rounds of heroics by Kell Brook. If they were to let him, the Kazakh with a punch like a jack-boot kick in the head would conduct his next piece of world middleweight championship unification business in an East End gutter outside the O2 Arena. The scariest middleweight since Marvellous Marvin Hagler more than a quarter-century ago elaborated: ‘I am a street fighter. I want brawls. Kell Brook is a boxer. A very good boxer. But it is a different style. If that sadistic wish had been granted, if the vicarious blood lust of the crowd had been sated by allowing Saturday night’s beating to continue unabated, Golovkin would have despatched Brook not only to the nearest emergency ward but into retirement. For the edification of those fans who saw fit to boo the throwing in of the towel by Brook’s corner, the fractured socket of his right eye will undergo surgery in his home city of Sheffield this week. New York, New York- Andre Ward (30-0, 15 KO's) has all of the credentials when it comes to being at the top of the sport. He won Olympic gold, cleaned out the super middleweight division, and has been on the pound for pound list for several years. Although he has had a very lucrative and accomplished career, he will finally make his headline debut on a pay-per-view platform this coming fall when he takes on unified light heavyweight champion Sergey Kovalev(30-0-1, 26 KO's) on November 19th at the T-Mobile Arena in Las Vegas. HBO PPV will handle the production and distribution. Ward's pay-per-view debut may have come later than expected, but he has no regrets with the path that he's taken. "When it comes to pay-per-view, you have to have the right dance partner for people to pay to want to see you fight," Ward told BoxingScene.com. "If you look at Manny Pacquiao and Floyd Mayweather, they had a lot of dance partners in their weight and above or below that warranted that. They worked hard for that too." "For myself, I am happy where I am. I built a great legacy, was able to take care of my family. For me I may not have 15 pay-per-views but I am comfortable in how my career has played out. I got no complaints." Ward went through a promotional dispute that took stalled his career for a few years and even he admits, it was tough and telling but he kept working. "It wasn't fun," stated the former unified super middleweight champion. "It was the toughest time I gone through in my life and faith in God. It strengthened me and grew me a lot and gave me a greater appreciation of things. It was tough but necessary." He says he never stopped working though. "If you guys didn't see me, I was working," said Ward. "Throughout the lawsuit, we just didn't fight as often as we would have, fighting once a year as opposed to twice a year. I wasn't active as I wanted to be but I was still working." "Mikey Garcia didn't fight for two years," explained Ward. "If a guy is taking that type of stance, the prudent thing to do is let me reserve my opinion because he's not making a living for a reason. It wasn't necessarily my case but I had to go through something similar." Garcia said the layoff extended his career on a physical and mental level. Ward feels his time off did the same. "I think I added a couple of years to my career," Ward said agreeing with Garcia. "I train really hard. I had injuries because of 20 years of repetition. I think I gained two or three years of my career. I needed the rest and I think he (Garcia) needed the rest. The hunger should be something you never lose and he proved it because he stayed in the gym like I did." A win versus Kovalev would provide Ward with a very convincing argument to proclaim himself as best fighter in the world. The Olympic gold medalist says a victory in November would certainly put cement his legacy. "I think I've accomplished a good amount. Whether its Hall of Fame or not - I don't have a vote. 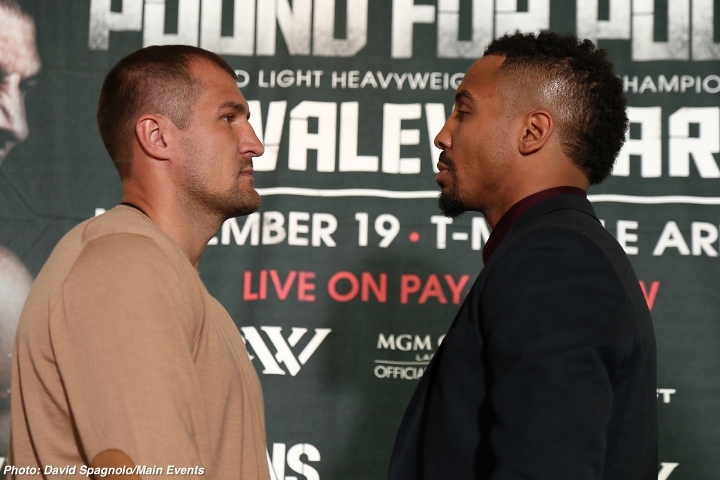 By winning this fight - regardless of how you feel - it cements my legacy," Ward said. Former champion Wladimir Klitschko said he is obsessed with regaining his world heavyweight crown and he would wait for as long as it takes for his re-match with Britain's Tyson Fury. The fight has been fixed for Oct. 29 in Manchester, having been postponed in July when Fury suffered an ankle injury, although doubts have been raised about whether it would go ahead after Fury was charged with an anti-doping violation. Fury, who denies the allegations, caused a huge shock when he deservedly took a unanimous points victory over Klitschko in Dusseldorf last November to de-throne the Ukrainian who had ruled the heavyweight division for a decade. Klitschko, who has since turned 40, said that defeat by the 28-year-old so-called Gypsy King had motivated him to get better. "It was actually a great experience for me," he said at a news conference in London at which Fury failed to show. "I always say that when one door closes another opens. I've gained out of it and have great motivation and I'm obsessed with the goal to get my titles back. "I'm patient. Even if it doesn't happen in October, I will wait. Time will eventually run out for Fury," he added. Fury's promoter Frank Warren said there were no "contractual" problems surrounding the fight and that it would go ahead -- saying UK Anti-Doping's independent tribunal into allegations of Fury testing positive for a banned substance would take place after the re-match. "The only problem today is Tyson's car," Warren said. Klitschko, who will be fighting to reclaim the WBO and WBA belts after Fury was stripped of his IBF crown because he did not fight a mandatory challenger, laughed off Fury's no-show. "Maybe he's here as the Invisible Man," he said. "It doesn't matter to me whether he shows up singing or as Batman or the Invisible Man, I'm ready for everything. I have my goal and I'm obsessed with that. I'm preparing well and just hope that he shows up in the ring in October." He suggested Fury would be a better opponent second time round, even if he is clearly not a fan of the Britain who he described as a "lunatic" for homophobic, sexist and anti-Semitic comments he posted in a video posted online this year. "I expect him to be better this time and I'm going to better and going to be different," Klitschko said. "We fought previously and know each other well. I hope he's training well because I want to fight the best Fury." Unbeaten Fury, who has courted controversy throughout his career, was charged with a doping offence by UK Anti-Doping (UKAD) on June 24 after a urine sample taken nine months before he beat Klitschko showed traces of banned substance nandrolone. However, Fury's legal team said the result of tests on the samples in March and May 2015 were contradictory and launched High Court proceedings against UKAD. A provisional suspension was lifted pending the result of an independent hearing. WBC president Mauricio Sulaiman is hoping that a future unification takes place between undefeated heavyweight punchers Deontay Wilder (37-0, 36KOs)and Anthony Joshua (17-0, 17KOs). 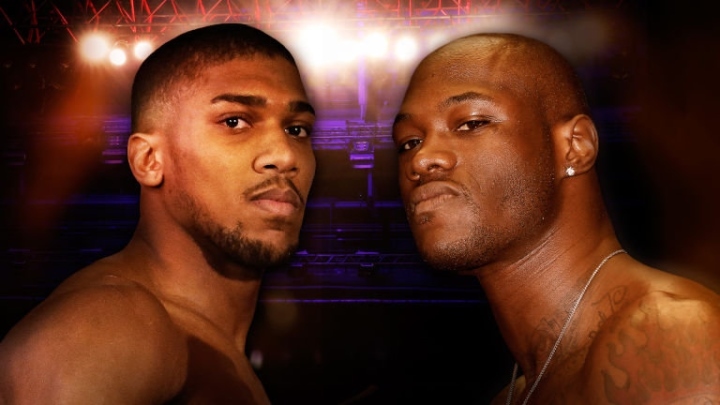 Joshua will be making the next defense of his title in Manchester in late November, but there is nothing set as of yet for Wilder - who is still recovering from injures that were suffered during his TKO win over Chris Arreola in July. Wilder hopes to resume his career by late January. Once he's back, he will either have a voluntary defense or collide with the winner of the WBC eliminator between Alexander Povetkin and Bermane Stiverne. Joshua's next opponent is unknown, but Kubrat Pulev has been mentioned in recent weeks as a frontrunner. The WBC President says Sulaiman is very important to his organization. The 2012 Olympic gold medal winner is already a superstar in the UK who fights on pay-per-view. His promoter, Eddie Hearn of Matchroom Sport, wants him to fight again in March and then have a major fight - possibly against Wilder - in the summer. Sulaiman told Sky Sports in an exclusive interview: "Absolutely Joshua is a very important fighter for the WBC. He fought for the WBC International title and the WBC was the first organisation to rank him. "We understand that he had a great opportunity to challenge for another organisation. He was WBC No 2 at this time. We wish him the best. He's one of the greatest fighters out there and is the future of boxing. "The winner of Bermane Stiverne v Alexander Povetkin is supposed to fight Wilder when Wilder is ready. So we would see how medical treatment is going and first we'll have the championship fight then we'll go from there but I'm excited to see Joshua fight for the WBC title." POUND-FOR-POUND No.1 Roman “Chocolatito” Gonzalez beat World Boxing Council super flyweight champion Carlos “Principe” Cuadras of Mexico to capture his fourth world title and create history by becoming the first Nicaraguan to win four world titles in four separate weight divisions in an exciting battle at the Forum in Inglewood, California on Sunday (Manila time). All three judges had Gonzalez the winner. Max DeLuca scored it 116-112, Robert Hecko saw it 115-113 and Cathy Leonard had 117-111. Gonzalez previously captured titles at 105, 108 and 112 pounds. He still currently holds the WBC flyweight world title. IBF flyweight king Johnreil Casimero, who successfully defended his title with a 10th-round TKO over previously unbeaten Briton Charlie Edwards at the O2 Arena in London hours before the “Chocolatito” showdown against Cuadras, told the Manila Standard the week of the fight that he was eyeing a title clash with the classy unbeaten Nicaraguan. Gonzalez applied the pressure in the eighth and had Cuadras on the run. A cut opened up around Cuadras’ right eye at the end of the round from a clash of heads. They were trading punches at the start of the ninth and Cuadras was getting to the target quicker. Gonzalez continued to press on, with Cuadras landing a big right hand to push him back. Cuadras was catching Gonzalez when he was coming in with some very good flurries. Gonzalez was pressing as usual and mixing up his punches with head and body work. Gonzalez looked very tired when the round closed out. The 11th started off with Cuadras throwing his flurries, while Gonzalez let his hands go and he was rallying with hard punches with both hands and had Gonzalez in some trouble at the end of the round with hard hooks to the body. The 12th round was a war with both boxers trading away at close range. They were letting everything hang out as they continued to trade shots until the bell. THE popularity of Canelo Alvarez was clear today at the Gaylord Texan Resort Hotel, where fans queued for three hours to watch what was advertised as a public workout. But Alvarez, who challenges WBO super-welterweight boss Liam Smith on Saturday night, only thanked his fans for coming, and did not work out. An explanation for the lack of action was not forthcoming from Golden Boy. As pound-for-pound king Roman “Chocolatito” Gonzalez was on his way to a highly competitive unanimous decision win against Carlos Cuadras to secure a junior bantamweight world title Saturday night before an excited crowd of 6,714 at The Forum in Inglewood, California, there was a very interested ringside observer. Fellow junior bantamweight titlist Naoya “Monster” Inoue (11-0, 9 KOs), the 23-year-old Japanese prodigy, was there to get a good look at an opponent who looms in his future if boxing fans get their way. Gonzalez-Inoue is a super fight in the small weight classes. Gonzalez (46-0, 38 KOs) is the P4P king and with his win against Cuadras gave him a world title in a fourth weight class to surpass all-time great Nicaraguan countryman and mentor Alexis Arguello, who won titles in three weight classes but failed twice to win a fourth title. He got knocked out twice by fellow Hall of Famer Aaron Pryor. Inoue won a junior flyweight world title in only his sixth professional fight in 2014, made one defense and then jumped up two weight classes to demolish veteran titleholder Omar Narvaez in the second round to win a junior bantamweight world title in his eighth professional fight later in 2014. Inoue has defended his belt three times and a fight with Gonzalez, who is well known in Japan from having fought there so many times, would be a big deal. His presence at ringside was not lost on Gonzalez, who made a career-high $400,000 for his effort against Cuadras (35-1-1, 27 KOs) who earned a career-high $250,000 for the HBO main event. “With pleasure I would face Naoya Inoue,” Gonzalez said when asked about the possible fight after defeating Cuadras in a tremendously entertaining fight. When asked if he believed his fourth title win was good enough to surpass Arguello as his country’s best fighter, Gonzalez, 29, said no. A Gonzalez-Inoue fight probably won’t happen in the next bout for either fighter but it could go down at some point next year. Before the serious prospect of the fight, Gonzalez said he would be willing to give Mexico’s Cuadras a rematch after what he said was the hardest fight of his career. “This was the most difficult fight of my career. I’ve never fought at this weight before, but I felt I won the fight,” said Gonzalez, who was greeted by thousands of supporters at the airport upon his return to Nicaragua. “I wasn’t hurt to the body, but I definitely felt the head blows. Anthony Joshua kicks off training camp for his second world title defence with public run. ANTHONY JOSHUA opened his 10-week training camp, ahead of his next world title defence, with a public run through Hampstead Heath. After he sent out a message on social media with instructions on where to join him, hundreds flocked to take a turn round the park with the IBF heavyweight champion. “I’ve been doing some light cardio, I’ve been doing conditioning. Boxing starts Monday, this is the start of my real cardio, now I can just kick into gear,” he explained. His fight will be on November 26 at the Manchester Arena, with Kubrat Pulev, Bermane Stiverne and Joseph Parker in the frame. The opponent will be unveiled in two weeks. WHEN boxers move up in weight they sometimes lose their power and their speed and become relatively different fighters than what they used to be in their previous weight division. Donnie Nietes, however, has shown no signs of slowing down nor of his power diminishing, and he looks like the same fighter who once dominated the minimumweight and light flyweight divisions. Nietes officially becomes a flyweight on Sept. 24 when he takes on veteran former world champion Edgar Sosa for the vacant World Boxing Organization (WBO) Inter-Continental flyweight crown in the main event of ALA Promotions and ABS-CBN’s blockbuster boxing show, “Philippines vs. Mexico”, at the StubHub Center in Carson, California. Judging by the way Nietes’ training camp has gone so far, Villamor feels that the fight won’t even go the distance because of how impressive he has been. “If there is a chance, I believe he will knock him out,” he said. Nietes has been training at the Freddie Roach’s famed Wild Card Gym in Hollywood, wherein he has put on some good rounds with two-time Olympic gold medalist and WBO No. 1 rated flyweight Zhou Shiming, WBO No. 12 super flyweight Ricardo Rodriguez and teammate Arthur Villanueva. The 34-year-old Nietes has done everything needed in training and is just now focused on cutting down in weight. “I don’t need to improve on anything anymore. We are already complete with our training and I’m focused on my weight,” said Nietes, who relinquished his WBO light flyweight belt to catch the bigger fish at the stacked 112-pound division. LET’S get one thing straight, Liverpool’s Liam Smith is being absolutely no chance of beating Canelo Alvarez on Saturday – particularly by the American press. Before today’s final press conference at the grand AT&T Stadium, the media huddled around Alvarez and bombarded the Mexican with questions about Gennady Golovkin. It was hoped that Alvarez would engage in a unification showdown with the Kazak after he knocked out Amir Khan in May, with his promoter Oscar De La Hoya promising to open negotiations immediately. They didn’t go very far, and within weeks, Alvarez relinquished the WBC middleweight title as the sanctioning body pushed for the fight to be made. Now, he returns to super-welterweight, a division he hasn’t campaigned in for three years, and takes on the confident and carefree Smith. Alvarez, two days before challenging the Englishman, insists Golovkin is still a target. Yesterday, Alvarez’s team insisted – quite rightly – that it was disrespectful to talk about Golovkin so close to the fight with Smith. But the fighter bristled under questioning today, no doubt tired of being accused of ducking “GGG”. The 26-year-old insisted he would have no worries about rising to 160lbs for the showdown, despite never weighing above his favoured catchweight of 155lbs. There have been suggestions that Canelo is struggling to make 154lbs, and he certainly had the look of a fighter locked in a gruelling battle with the scales. Unsurprisingly, Alvarez rejected claims that he is struggling to lose mass. “Every fighter goes through cutting the weight and there will be no issues,” he said matter of factly. Incidentally, the possibility of a Golovkin-Smith showdown wasn’t mentioned once. The fight is official. 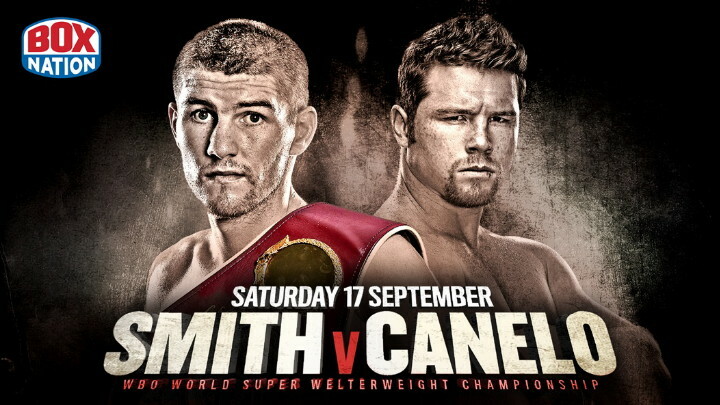 After both Canelo Alvarez and Liam Smith made weight on Friday afternoon, the WBO welterweight title fight is on. Canelo, who dropped his WBC middleweight crown to delay his mandatory bout with Gennady Golovkin, will get his first shot at a lower weightclass belt since 2010 when he reigned as the NABF welterweight champ. Now he gets Smith, who will face his first top-10 opponent ever. It all goes down at AT&T Stadium on Saturday night, Sept. 17. The fight card consists of two main card bouts including Willie Monroe Jr. and Gabriel Rosado. Monroe is the betting favorite, going off at -170 to Rosado's +140. The action begins at 9 p.m. ET on HBO PPV. You can order the bouts through your local cable provider on TV or order the live stream of the action on your computer fromGoldenBoyPPV.com. Saul 'Canelo' Alvarez seized the WBO world super-welterweight title with a spectacular ninth-round stoppage of the valiant Liam Smith. The Liverpudlian (23-1-1-KO13) was knocked down three times on his way to a first career loss as Alvarez (48-1-1-KO34) shone in his first world title fight at 154lbs since the points defeat to Floyd Mayweather almost exactly three years ago. In front of a crowd of over 50,000 at the AT&T Arena in Texas, Smith entered the ring first despite his status as the incumbent. Alvarez's huge popularity was evident as the huge crowd rose to salute his arrival to blaring mariachi music. The red-headed Mexican looked much the sharper in the opener; immediately adding swift straight rights to his superior jab and making the champion fall short with the minimal counter punches coming back. Smith began the second tucked up tightly and his attempts to emerge from his shell were discouraged by some flowing combinations from the challenger - but a small cut by Alvarez's left eye provided the first glimmer of hope for 'Beefy'. The visitor looked unsettled by some vicious body work from Alvarez early in the third, bringing the Alvarez uppercut into play as Smith looked to compensate with more protection downstairs. By the end of the round, though, he was landing shots of his own but they were not enough to claim the round. The fourth was more of the same as Smith enjoyed another encouraging late-round resurgence and Alvarez spent several periods on the ropes in the following session. The hint of success came at the cost of two cuts above the right eye but Smith may have felt he'd done enough to belatedly get on the scoreboard. The crowd were ignited by a brief face-off between the pair sparked by a Smith shot after the bell and the subsequent sixth yielded some great action before Smith was warned for hitting on the break. A breakthrough came in the seventh with Smith looking to impose himself and press Alvarez against the ropes. The ambition was punished by a solid overhand right behind the ear that sent Smith crumbling to the canvas, although he was soon up and registering a decent riposte of his own. Alvarez was happy to edge ahead in the eighth before again retreating to the ropes and when Smith's activity briefly dipped, he scored a second knockdown; winging in a left to the solar plexus that prompted the champion to sink to his haunches and gasp for air. Smith refused to go quietly but found himself on the ropes for the first time in the fight in the ninth with Alvarez targeting the body. The finish was emphatic. Having lured Smith in again, Alvarez clipped in a left hook upstairs to set up a thunderous shot to Smith's kidney area, collapsing his man before the referee waved it off. There was a high-profile victory for Willie Monroe Jr (21-2-KO6) on the undercard as he outpointed Gabriel Rosado (23-10-KO13) 116-112 118-110 117-111 with some slick boxing from the outside. Earlier on in the evening, London light-heavyweight Anthony Yarde (8-0-KO7) introduced himself to American audiences with a first-round stoppage of Rayford Johnson. LIAM SMITH revealed he hadn’t sparred since the beginning of August after losing via ninth round knockout to Canelo Alvarez inside a raucous AT&T Stadium in Arlington, Texas. The Scouser lost his WBO super-welterweight title to the superstar, after a stirring scrap. Smith suffered the injury while sparring Kell Brook, but opted to go ahead with the bout, believing he could still pull off the upset.